Roo goes back to school on Wednesday. I'll be the first to admit that I am totally not prepared for the new school year, although I've been wanting the kids to go back for months already… it's been so hot that they don't want to go outside and I can't really blame them. Being a summer shut-in has lost its charm so I'm looking forward to school starting even though I don't have everything crossed off my to-do lists yet. One thing I feel ready to get back into the hang of is packing lunches. Summertime has felt a bit like being a short-order cook with both kids shouting out requests all day long. I'm pretty excited to get the old sandwich train a-rolling! 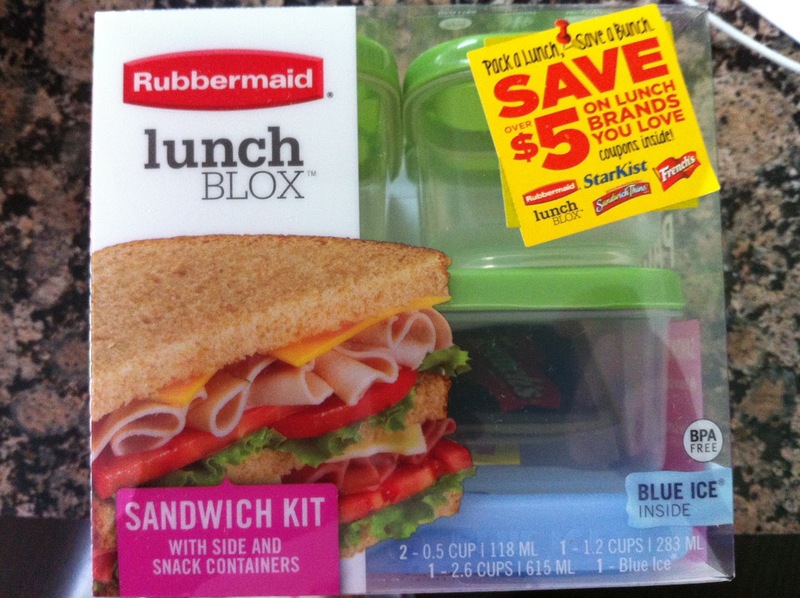 Rubbermaid recently sent me a Sandwich Kit to try from their nifty new modular LunchBlox collection. All of the pieces in the line stack together in multiple configurations, including different sized containers and Blue Ice. You can fill them with whatever you can think of and each food group will remain chaste in their own snugly sealed receptacles without the dreaded lunchtime mixing/melting effect. Grapes don't squish, nuts and crackers stay crispy, sandwiches don't get soggy. The Sandwich Kit features four containers and Blue Ice, any of which can be used together or separately in a LunchBlox insulated LunchBag or whatever you like to tote your lunch in. Even that old rusty metal Star Wars lunchbox…The containers are all microwave-, dishwasher- and freezer-safe and BPA-free, too. Even if you aren't packing lunch for kids, these would be handy for weight watchers to practice portion control when taking lunch to work. Kmart, Kroger, Safeway, Bi-Lo, Winn-Dixie, HEB, other grocery stores and select Wal-Mart stores. Follow Rubbermaid on Facebook or on Twitter @Rubbermaid and visit their Adventures in Organization Blog for more information and ideas. In accordance to the FTC Guidelines and the WOMMA Code of Ethics, I am disclosing that I received the LunchBlox Sandwich Kit shown to facilitate this review. No other compensation was provided and all opinions are, as usual, entirely my own. I agree that those have use beyond school lunches!